Android 4.0 (a.k.a. Ice Cream Sandwich) is the prettiest, most intuitive version of Google's mobile OS yet, but hardware manufacturers still insist on dirtying it up. Android skins are inevitable, but who does it best? See for yourself. In each of the comparisons, below, HTC will be on the left with its Sense 4.0 skin; Motorola will be in the middle, with an unnamed skin (previously MotoBLUR); Samsung will be on the right with its latest implementation of TouchWiz. For your reference, here's a gallery of the same screen running stock Android 4.0 (Ice Cream Sandwich). 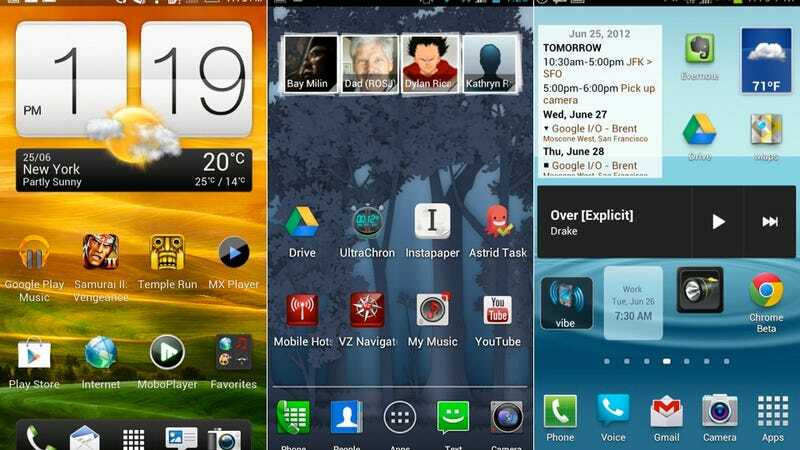 At the top of this post is the Android 4.0 homescreen, as interpreted by HTC, Motorola, and Samsung. Each of them has a bottom row of four icons, and they're all swappable (thank jeebus). All of them also support scrollable widgets, which is very handy. The only major difference among them, really, is that Samsung puts the Apps icon on the far right instead of middle by default. Samsung and HTC let you pinch to see all homescreens, however, and Moto doesn't. Between that and aesthetically pleasant time/weather widget that's been Sense's hallmark, HTC gets the win. All three skins offer lockscreen shortcuts to jump straight to different apps, and music controls are available without the need for a password. Both handy features. HTC requires that you drag the unlock icon down to a circle below, which rises up to meet you, which isn't totally intuitive. Its four shortcuts are mirrored from the shortcuts on your homescreen, which is either convenient or not depending on personal preference. Motorola doesn't let you choose which shortcuts you have at the lockscreen, which is lame. Samsung is nice and clean-looking, but you have to go deep into the settings to set your shortcuts. Also, because a swipe in any direction unlocks your phone, TouchWiz is prone to more accidental unlocks. Or maybe just use a PIN! We're calling this one a tie between Samsung and HTC. Each skin gives you multiple options for sorting your content, though with slightly different takes. HTC's is apps-only; if you want to sift through widgets, you have long-press the homescreen. Motorola leaves ICS pretty well alone here, including both apps and widgets, plus sorting. Samsung includes apps and widgets, though with fewer sorting options. Also, TouchWiz doesn't include a shortcut to Google Play for downloading more apps. Moto and Sense both do. Point: Motorola. Samsung takes the win here. Why? HTC is a bit bright, and more importantly, doesn't include a shortcut to Favorites. Motorola's got its own problems; if you want to open the dialer, it switches you over to a separate app. Samsung has everything in one place, plus the neat trick automatically dialing a selected contact just by lifting your phone to your ear. Noice. Speaking of dialers, Samsung wins this one, too, for the exact same reasons it won Contacts. HTC's native camera app is not only intuitive and easy to use, but it's also highly customizable; that can be a difficult line to walk. Motorola's is nicely laid out, but also very intuitive; it's just a bit more bare-bones. Samsung (which wouldn't let me screencap while the camera was open for some reason) has a customizable layout, which is nice, but the menu is actually a bit more cumbersome to navigate. They're all good, but HTC gets the nod for being the best of both worlds. HTC's calendar app is head-scratchingly bad. Not only does the monthly view show no information, but there's no weekly view option at all. What the hell were they thinking? (UPDATE: You can enable a weekly calendar in Sense 4.0, but it's buried in the settings. Thanks, slickdylan!) Moto's calendar app is quite good. Easy to navigate, easy to change which calendars are displayed. Samsung surpasses them both, though. As you can see, the information density is just way, way higher than on Sense or Moto. Not only can you see more info on the individual days, the little itinerary at the bottom is rather useful. HTC and Moto are pretty much identical, and very close to stock, which is just dandy. Samsung, though, has a handy set of toggles (which it's been implementing since the early days of TouchWiz). Need more info? Swipe right. Simple, clean, efficient. We love that, but we wish they were customizable, as you'll never use most of them, and it's missing a few options—like screen brightness—that seem like they would've been no-brainers. Still we'll give Samsung the edge. To be honest, it really all boils down to personal preference. HTC has the edge on looks and intuitiveness. Samsung packs in more functionality, but holy crap is it busy. Motorola is very sparse and simple, but there's a lot to be said for sticking close to stock ICS.